f.30' View from the Top of the Fall looking South up the valley of Sulphur' (Lakhi Pass, Sind). 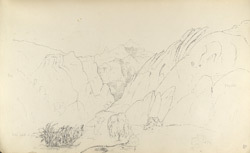 bl.uk > Online Gallery Home	> Online exhibitions	> Asia, Pacific and Africa Collections	> f.30' View from the Top of the Fall looking South up the valley of Sulphur' (Lakhi Pass, Sind). The Lakhi Hills, situated in Sind (Pakistan), are 50 miles in length and were formed by volcanic action, as exhibited by the frequency of the hot springs and sulphurous exhalations that occur here. The Lakhi Pass is commanded by the town of Sehwan, a key strategic location for all invaders in the region.